breath * life * flow: beauty trip. i am a traveler at heart; even our first blog post was devoted to our kai team's summer travels: http://bit.ly/NPaUWG one would think after all these years i would be an expert packer, but i'm still guilty of tossing a kai lotion into my handbag at the last minute -- and crossing my fingers it makes it through airport security (it doesn't). i've often wondered how many bottles of kai have been enjoyed by TSA agents! 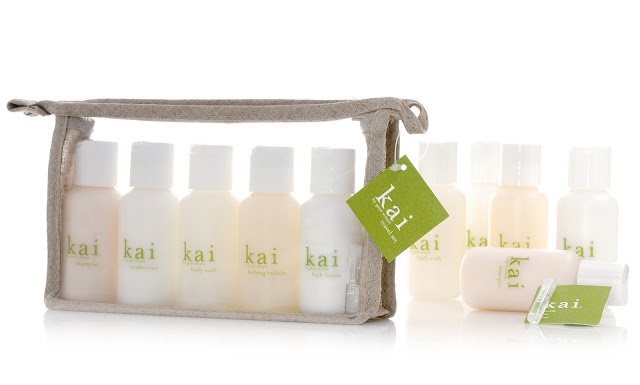 so i'm beyond excited to introduce our new kai travel set. after the launch of our shampoo & conditioner i felt we had all the components to create a complete travel set. 2 oz. 's of kai essentials to indulge in on a long flight, tropical honeymoon or cozy weekend away. bon voyage! I want to plan a trip just to take this with me! I cannot wake to bring this on my next trip to truly create a home away from home feel!